Okay, first things first. I made two name changes because I felt they were more or less necessary, but the rest were left as-is. However, there were numerous mispellings in the pre-battle banners (including Ver being "Ver" in her solo banner, but "Vel" in the trio) - I took those on Mogeko's character pages to be the correct ones. The other name change is Vendetto; he was originally Adauchi, which means "vengeance." Because his bonus room bio explicitly says it's a nickname due to his "vengeful-looking face," it didn't make much sense to leave it that way. The original title was Oounabara to Wadanohara - a pun on how Wadanohara's name is written with kanji that mean "a great expanse of sea" (oounabara), but is read as Wadanohara (kind of a stretch given the usual kanji readings, but furigana allows for that kind of thing), so it's the same thing twice. Yeah, I technically switched it because it sounded better. Any kind of compromise would have made for a very awkward addition of the translation ("I'm Seablue the Great! But I'm indie, so call me Wadanohara.") or a very awkward title (Wadanohara and the Watery Hurrah). And even if I were to do heavy localization on all the names - which I'm always hesitant to do without good reason - you've still got these Japanese-style princesses and palaces and Tatsumiya and a tanuki... So that would be a silly endeavor. Since the names are much more Japanese-based than Gray Garden's and not localized, here are the explanations for them. Memoca's nickname for Wadanohara was Wadacchi. The other two, which only appear twice, were Dolpin (her name is just spelled "Dolpii" in Japanese so) and Fukamin (unchanged for English). Chlomaki is from kuro (black) due to her color scheme. Mogeko seems to waffle between that and "Kuromaki" (which would be the regular romanization), but let's be real, Chlomaki is way better. Samekichi's name comes from same (sah-meh), shark. I didn't get as far as coming up with a good localized name. I still can't. There exists no pun name for a shark that's actually worth taking seriously. Lobco is obvious, but my short-lived localized name for her was "Loberta." Which I kinda like, but is rather unnecessary. Irena's name is based off "siren," and her non-appearing (because Mogeko didn't feel like making talk sprites for a brief apperance) sister Reley Lo comes from "lorelei." Tatsumiya is pretty clever. "Ryuuguu no tsukai" is a kind of oarfish, literally "envoy of the Sea God's Palace." Which is... exactly what she is. But the name is also sorta obvious, because the kanji for it are just those for "Sea God's Palace," and Tatsumiya is an alternate reading. The kanji in Uomi mean "fish sea," and Totsusa's nickname for her was Umi-chan. Totsusa's name starts with the kanji for "rabbit." She was originally Tosatsu (it was changed in 1.04), which straight up means "slaughter." (As such, she said "I'm gonna tosatsu you, Uomi!" quite a bit, but these were edited to just "kill" when the change was made.) Uomi's nickname for her is Sacchan. The kanji in Mikotsu mean "sea bones." Meikai's name means "ocean" in a way similar to Wadanohara's. Hofuru means "slaughter" (verb). It was probably meant to show her new allegiance to Tosatsu "Slaughter" Kingdom (except it's Totsusa now). Yayoi, her real name, basically means "midnight." And yes she's a tanuki obviously. Tsuribari simply means "fish hook," which... should be apparent. Given the existence of other Dead Fish, Dead Fish 5 is probably not a Deadmau5 reference, despite all our hopes and wishes. The issues of gender I discussed in the Gray Garden notes apply here too, perhaps in fuller force. But not really a problem because I had official clarification in advance this time. According to Mogeko, the genders of Tarako and Sheep are explicitly unknown/ambiguous. I always figured Sheep would be, as they're just... mysterious in general. Tarako, though, I initially thought was referred to as a boy in their bio, as it says おとこのこ. However, this is sneakier than it appears - it could be 男の子, boy, or 男の娘 - which I believe would make Tarako a trans girl. I asked for further clarification, and was told that おとこのこ is what Tarako calls themselves, but - presumably because of the above duality - "its true meaning is unknown." Lastly, Tarako uses "boku" and everyone calls Tarako "-chan." So, yes, ambiguous. I decided to make that part of the bio into "identifies as Tarako" to bring attention to the intentional ambiguity of their gender, and to show how we're just taking Tarako at their word. Most area names and things were straightforward. Though "kazaguruma" can mean both windmill and pinwheel, hence the presence of both on that island. Hm, maybe Windwheel... nah, that sounds silly. The Cast Pearl was... well, the original name literally meant "pearl left in the ocean," but that's actually an idiom (Chinese, not Japanese, interestingly) referring to unrecognized talent. My name is primarily a play on "casting pearls before swine" - Meikai's sacrifice might be considered a waste, and Wadanohara's in Normal End 2 is certainly considered so, as no one is too happy about the sea being (temporarily) saved if it means losing her. "Cast" could also refer to the magic involved, or "casting out" Mikotsu, or "cast into the sea," or etcetera. Dolphi's weapon of choice (translated as Meresword, from mereswine, another name for dolphins) was the "Irukatana," which is not only a portmanteau with iruka (dolphin) but also resembles it - イルカ versus イル刀. Fukami's (translated as Smacktopus Hammer) was the Takotako Hammer, where tako is octopus, and "pikopiko hammer" is... just sort of a thing in Japan for squeaky toy hammers. Gull-a-Bull was "Kamome Kamone," literally something like "it might be a gull." Pulmo just eloongated some woords in Japanese tooo, so it's preetty much the same thiing. Though maaybe not used aas often as I used iit. Also she just goes "fuwafuwa~" sometimes, in case you didn't get that she was floaty in every way. I just sorta directly made that "fwaaah," although maybe it makes her sound more sleepy than anything. The dramatic reveal: Miyura called Seguro and Helica her "senpais." Which is extra awkward to translate outside of a school setting, but "main squeeze" seemed to work alright - I mean, no one has seemed to catch on to it being a translation of "senpai" or found it out of place. But sometimes it was more appropriate to have her just say "dude" when the main squeezes were actually present. And it fits her way of speaking - she used "ssu" and stuff a lot, somewhat like Emalf but not nearly as much of a creep. "Usa" was pretty much directly translated to "bun." The resulting creation of lines about "so many buns" was extremely intentional. While it made most sense to translate "shi no umi" as "Sea of Death," it's technically the Japanese term for dead zones. Read into that as you will. When Uomi and Mikotsu meet, the latter's skeleton fish actually calls Jiiya 魚綿守. I'm... really not sure how to romanize that. Probably Uowatamori? Anyway, it appears that's his real name, not Jiiya - "jiiya" is just what he's called, as it means something like "an old manservant." I wasn't sure how to best translate that - Retainer, maybe - and I realized this rather late, so it would be troublesome to change. The line would make little sense if he were called Jiiya like it was a name the whole time and then got called something else, so I decided to effectively make his name Jiiya. Seriously, nobody ever calls him 魚綿守 outside of that one line. Like with Gray Garden: assorted pun explanations. The "maybeef" mermaid NPC said kashira (I wonder), then said she likes kashira-niku, which unlike "maybeef" is actually a thing. The "Cli one? Cli two?" clione said "kurikuri shita oneesan? ", which means "lady/big sister with big round eyes" and is a joke on "kurione-san." A red clione in Coral Sea goes "buccal cone!" in hiragana, but a blue one in the castle says the same in the proper katakana, because they're so much more refined (maybe). Samekichi's confusion between goldfish and mermaids is more reasonable in Japanese, because kingyo and ningyo. Tarako's mistaken names for Samekichi are replacing "same" with some other kind of fish, like Sabakichi (saba is mackerel). Sometimes I "left it," but sometimes it felt better to translate it, like Tunakichi. The fish soldiers going "gyo(h)!" is, of course, a joke on one of the readings of "fish" being gyo. As anyone who knows Junji Ito should know. Okay, time to talk external info. It's never mentioned in Wadanohara (well, it is used for his name in two text boxes seemingly by mistake - I kept this in the English version just 'cause), but the Orca's name is Idate. Idate comes from Iceberg Isle, the cold place shown in The Squid Returns and the setting of Ice Scream, one of Mogeko's other stories. Despite fitting the sea theme, it really does feel like he's just "passing through" this game. Much like the passing demon, I suppose. Also, this is evidently Laurentia's twin sister. Again, a mystery that probably wasn't of much importance. It's also likely that Vendetto's dad is Ivlis (that airhead) and his sister is Poemi. Ver's family, though, who knows. If you were wondering how mermaids can travel on land (seriously, wheelchairs, I'm telling you), given [a deleted picture of Reley Lo with legs], I assume there's some kind of spell to give them legs. Seemingly Seguro can't get any use out of it, since he says he can't move on land at all. The bar bonus scene has five cameos. At the bar are Maekami, Sullivan, and Gyakuten. At the other table from the mercs are Giltz and (probably) Setsudan. In the pan over the witch world, there are five non-generic witches: Shiroame, Kaen, Starlit Night, Hanahata, and Bloody Mary. Then in the scene later, there are twenty witch silhouettes that get shown, plus the Great Witch. I'm not listing every one of them, but they are actually witches from the character pages, and they appear in the same order as their numbering there. Furthermore, it seems like Mogeko just had ten witches for a while - Chlomaki is the first, Wadanohara herself is the seventh - but made ten more toward the end of development, and slowly put them on the characters page later. The girl visiting the grave on Lonely Isle is Noir. Noir idea what she's doing there - I hope she's not mourning her adorable pig. The one talking to a snail on Hydrangea Isle is Tsumuri from Poison Bugs, though you can't see his six arms or claw tail on the sprite at all. Also, the snail is most likely Maimai. The penguin who finds the squid is Rock. He's from Ice Scream, and Idate seems to consider him a friend of sorts, which would also make him the friend he mentions in Love to Stroll. In case you didn't notice Sal casually referring to it, nor the pictures on the bonus page... yeah, Samekichi and Sal are twin brothers who grew apart, the reason for which seems quite apparent. Old has been confirmed as their father (though "no one knows this, not even him") and neither "Samekichi" nor "Sal" are their original names - Wadanohara came up with the former. There's also a rather interesting comic on the bonus page after Normal End 1, which I translated here. Along with some... more offbeat ones. And while we're talking about that ending, I noticed while doing the character bios that the exact value of the text color for the Red Witch Wadanohara bio is 65 red, 0 green... 1 blue. Oh. Samekichi orders it from Nekoyama, he gets it, and next full moon, he gives it to Wadanohara on Star Isle. After the incident with Sal - and losing her memory of it - Wadanohara, now with her new familiars, travels to the witch world. Fukami steals the ocarina and leaves it behind when they leave the witch world, because he can't stand the thing - he loves Wadanohara and is extremely jealous of Samekichi. In the second bad ending, Fukami's jealousy comes to a violent head, though seemingly it required an additional push from Sal and maybe the Sea of Death itself. The night Samekichi goes away, Fukami again steals the ocarina, hoping it will keep Wadanohara from remaining attached to Samekichi. 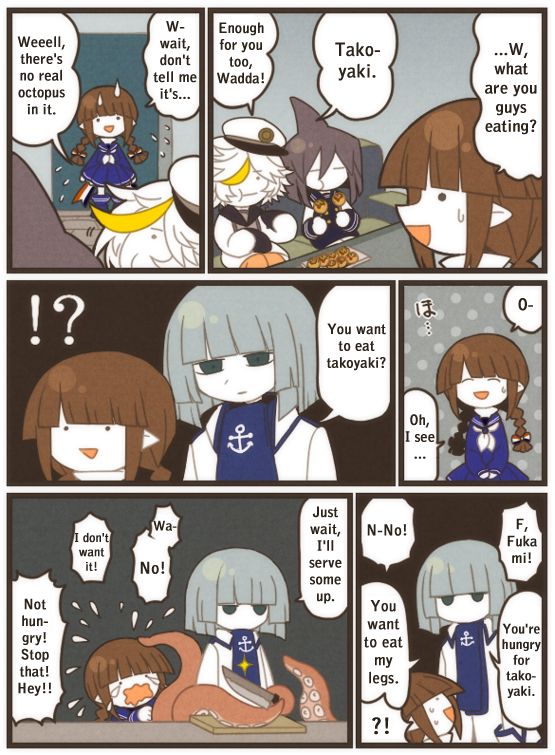 Presumably the "even Fukami gets jealous" conversation with Tarako happens while Wadanohara is recovering and he has the ocarina, but don't ask me how the topic came up. But anyway, whatever Fukami's original idea was, he ultimately decides to have Nekoyama deliver the ocarina back to Wadanohara - a method that keeps him out of the equation. While it could be he engineered the crying scene as a way to get Wadanohara to rebound toward him, at least by the time it happens, it probably really is out of concern for her bottling her feelings. Because once the ocarina arrives, he tells her to believe in Samekichi - Fukami comes to accept that Wadanohara loves Samekichi, and it would be wrong to take advantage of her in his absence. I wish I could end with a brilliant reveal about who Wadanohara's mother is, but... I really have no clue. (Though Mogeko confirmed that Wadanohara does have a mother who will be explained eventually.) As a Father implies that she's related to the moon ("she, the moon... I, the sea..."), which could mean her name is moon-based like Meikai and Wadanohara's are sea-based. Given she produced an egg, one would suppose she's not fully human. Also, I think she pretty much has to be dead, because otherwise we'd surely hear something more about her, and particularly with that line, it just seems right that she'd be dead along with Meikai, so they're both truly "watching over" Wadanohara. Arguably, it could be Tatsumiya - Old talks about her "hubby" dying, and pretty clearly means Meikai, though maybe he's using it in a sarcastic sense. But it just seems so awkward if that's true; no one acts like she's Wadanohara's mom whatsoever, just a mentor who filled the role of cute mom for her. Meikai also doesn't really talk to Tatsumiya like she's his wife (he reminds her that "my daughter, Wadanohara" will still be around, not "our"). I guess it's possible that Meikai is referring to Tatsumiya with "she, the moon," yet she had no role in making the egg because it's just self-made with magic... but that's pretty weird. I feel like the best lead is Totsusa Kingdom - I mean, they're probably rabbit-themed for a reason, right? (If you weren't aware, rabbits are very much connected to the moon in Japan.) But I don't think anyone featured in the game would really fit as Wadanohara's mother. Maybe she's the Easter Bunny.